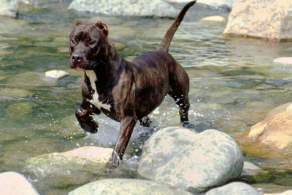 The American Staffordshire Terrier, often called the Am Staff (or Staffy), is a medium-sized breed that is descended from the Staffordshire Terrier of England. 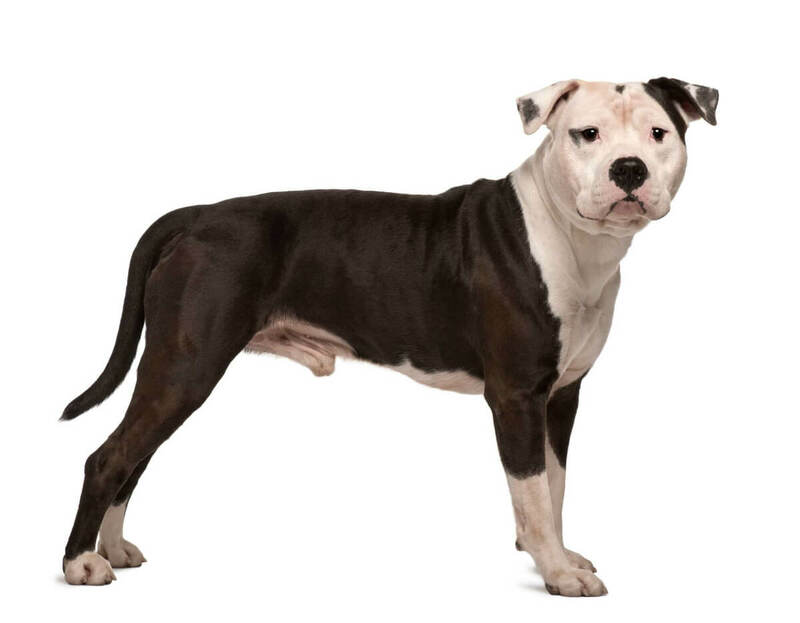 When its Am Staff ancestors were first brought to the U.S. in the late 1800s, this dog breed was developed mainly for its unmatched ability in the dog fighting pits. Hence the Am Staff is one of several breeds commonly referred to as Pit Bulls; the Am Staff has since gained a reputation as a vicious killer – which, if trained to be so, it is. But as many Am Staff owners know, this "killer" reputation is often undeserved. By nature, this breed is incredibly playful, warmhearted, and sensitive; these dogs are also very loyal to their loved ones, and by instinct will fight to protect them – and any fight they will invariably win. Am Staffs will require a lot of consistent, gentle obedience training, and all sorts of socialization with people and other animals, to learn to be kind. But if taught well, this breed can be a remarkable addition to any family. Below are the details and specs for the American Staffordshire Terrier dog breed. The Am Staff is a medium-sized breed. Males weigh 50-70 pounds, and stand 18-20 inches tall at the shoulders; females weigh 45-60 pounds, and are 17-19 inches in height. Contrary to popular opinion, the typical Am Staff is happy, remarkably playful, and affectionate; it is also extremely loyal to its human family, and is intensely protective of them. This breed will defend its loved ones at all costs, and will require a great deal of obedience and temperament training, along with as much early socialization as possible, to teach it proper behavior. A well-balanced Am Staff is great with children, but since it was originally bred for dog fighting, an Am Staff's instinct is to be aggressive towards other animals, especially other dogs. This breed needs a moderate amount of care. Required grooming is negligible, but a good deal of exercise, along with plenty of behavioral training, will be necessary. 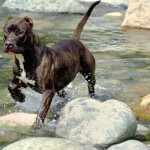 The Am Staff is descended from the Staffordshire Bull Terrier, which itself originated in England. In the early 1800s, dog fanciers sought to develop a breed that combined the agility and vigor of a terrier with the toughness and bravery of a bulldog; with this in mind, breeders began crossing various bulldog and terrier types, and the result was a breed that originally had a variety of names, including the Bull-and-Terrier and the Half and Half, but was later renamed the Staffordshire Bull Terrier. 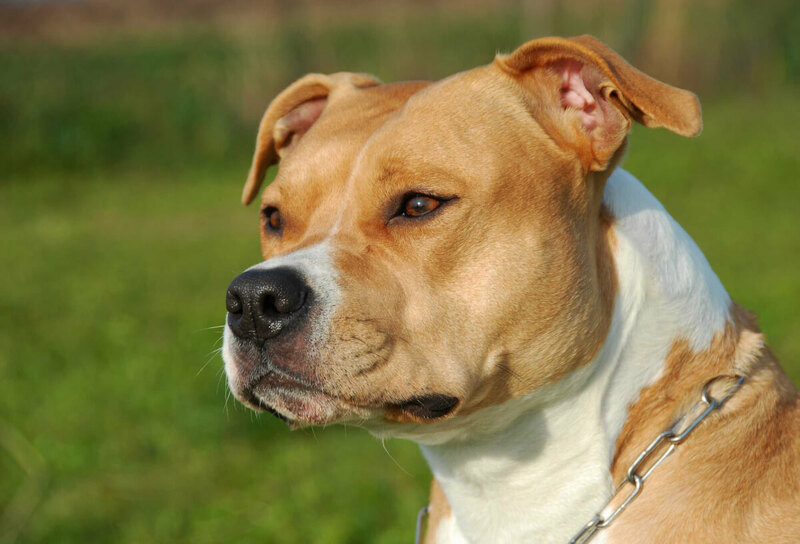 By the mid-nineteenth century, dog fighting became a popular sport in England, and though it was quickly declared illegal, Staffordshire Bull Terriers gained notoriety for their unmatched prowess in the "fighting pits." 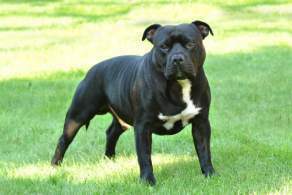 Over the next several decades, as dog fighting likewise became fashionable in the U.S., Staffordshire Bulls made their way across the Atlantic, with similar results. 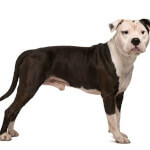 In the U.S., where the breed became known as the American Bull Terrier or the Yankee Terrier, people preferred dogs with larger bodies, ones capable of overpowering their opponents. As the years passed, the Staffordshire Bull Terrier (of England) and the American Bull Terrier began to diverge in both size and temperament. 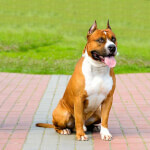 In 1936, the American Bull Terrier was officially recognized by the AKC as the Staffordshire Terrier. (The organization revised the name in 1972 to the American Staffordshire Terrier to differentiate it from the Staffordshire Bull Terrier and the American Pit Bull Terrier, which were by then acknowledged as separate breeds; the AKC recognized the Staffordshire Bull in 1974.) In the latter twentieth century, the Am Staff (along with other breeds including the American Pit Bull Terrier and the American Bulldog) became embroiled in controversy, particularly in the U.S., where Congress enacted several laws that aimed to control and/or ban certain dog breeds. Today, though, this scrutiny has relaxed somewhat, and the Am Staff is prized for both its guard-dog ability and its affectionate temperament. The Am Staff has a short-haired, stiff coat that normally has a glossy sheen. The overall impression of this breed's body, which is usually a little greater in length than in height, is one of power, agility, and athleticism. This breed is celebrated for its powerful head, which is the shape of a soft oval, with muscular jaws and a short, rounded muzzle. The eyes are set low on the skull, of medium size, round or almond-shaped, and are normally brown in color. The ears, which are often cropped, are medium-sized, high-set, and triangular in shape; they are often erect, but if uncropped may hang slightly. The powerful neck is arched a bit, and the chest is both deep and broad. 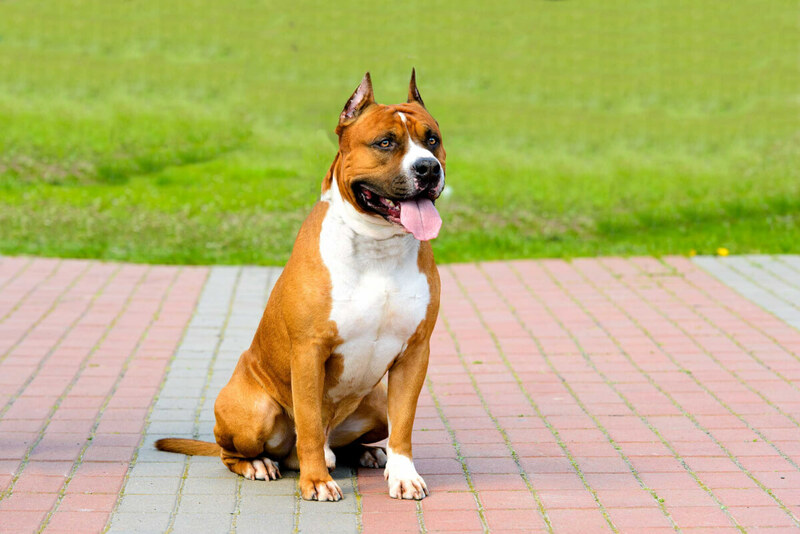 An Am Staff's topline usually slopes a bit from front to rear, lending to the breed's streamlined, agile appearance; the shoulders and thighs are extremely well-muscled. The forelegs are wide-set and straight, and the hind legs are angled back somewhat, adding to the Am Staff's streamlined look. The tail is relatively short, low-set, and curved slightly. The Am Staff exists in a wide variety of coat colors, patterns, and markings. Colors include black, fawn, blue, brown, liver, red, and white. 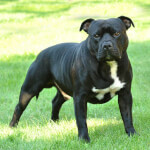 The breed's coat can be brindle, patched, or spotted, and some dogs can have masks of blue, white or black. 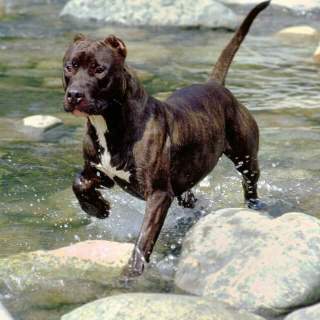 Though an Am Staff's dominant presence often makes it seem larger, this is actually a medium-sized breed. Males are 18-20 inches at the shoulders in height, and weigh 50-70 pounds; females are 17-19 inches in height, and weigh 45-60 pounds. Courageous, attentive, loyal, and friendly, the Am Staff is by nature a fun-loving, affectionate animal – but when posed with a threat, it may morph into a vicious, relentless killer. As a terrier, this breed has an instinctually high prey drive; since its breed history includes decades of fighting in the dog pits, an Am Staff may be aggressive towards other animals (particularly other dogs). Contrary to many people's opinions, though, these dogs are naturally warmhearted animals, and if provided with proper temperament training, will make excellent family companions. That said, consistent (but by all means gentle) discipline, along with early socialization with all types of people and animals, is an absolute must for this breed. Much has been written about the various methods of instilling proper behavior in breeds like the Am Staff, but most professional trainers agree that this obedience training should start when the dog is a puppy, and should be positive and reward-based. Something as simple as teaching a young Am Staff to "sit," and then giving it a dog treat when the command is carried out, is a basic tool that will help the puppy learn discipline; as the commands – "heel," "stay," and "come," for example – become more complex as the dog gets older, it should instinctually follow them, as it will usually know the owner is the boss. In addition, trainers recommend that Am Staff owners have their dogs spend time with a variety of people – friends and strangers, adults and children – with the dog closely supervised, of course. Am Staffs are very intuitive, and will normally take cues from humans as to how people should be treated. Some new Am Staff owners who feel unable to fulfill the above-mentioned necessities enroll their dogs in obedience classes (or puppy kindergarten, if the dog is young). The typical Am Staff is a people-pleaser, but it can also be stubborn and at times difficult to train, particularly when teaching it to be housebroken. These dogs need a lot of attention, and may become catastrophically destructive if bored or left alone. (In particular, they love to chew things, so experts suggest providing plenty of bones and rawhide – better it chews on those than on shoes or furniture.) But this breed is intensely devoted to its human family, and will fight (to the death, if necessary) to defend them; it probably goes without saying that the Am Staff is simply unmatched in its guard-dog abilities. Whether loving or vicious, protective or stubborn, this breed can be quite a handful, and will likely be too much for a first-time dog owner to handle. An Am Staff should be properly socialized with children; moreover, they should be closely supervised, especially as puppies, when around smaller kids (or elderly or disabled people, for that matter). Young Am Staffs are very excitable, and they show their enthusiasm by romping and jumping about, which can send everything (and everyone) in their paths flying. Trainers recommend having the dog spend time with children of all ages – and the younger the dog, the better – in order for it to learn respectful behavior around them. Socializing these dogs with other pets, from puppyhood if possible, is an absolute must. (In fact, trainers advise against introducing a mature Am Staff into a home where other pets already live, as the dog's instinct is to establish its territory by injuring or killing other animals.) These dogs were developed in part to fight other dogs, so their instincts are to seriously injure and/or kill other canines. And with its instinctually high prey drive as a terrier breed, an Am Staff will tend to chase and seize cats. If raised with other animals – and socialized often with them – from a young age, it will likely be somewhat friendly towards other pets. Even so, this breed will react to any threat from other animals with severe aggression. As with children and other pets, proper education on the treatment of unknown people is an utter necessity for an Am Staff – and the earlier, the better. With strangers, though, the typical Am Staff may not be as aggressive as it will be with other dogs (which it was bred to fight). If a stranger is completely non-threatening, it will likely be reserved around him or her, and possibly even friendly. Again, an Am Staff will likely take a cue from its owners as to how someone should be treated. 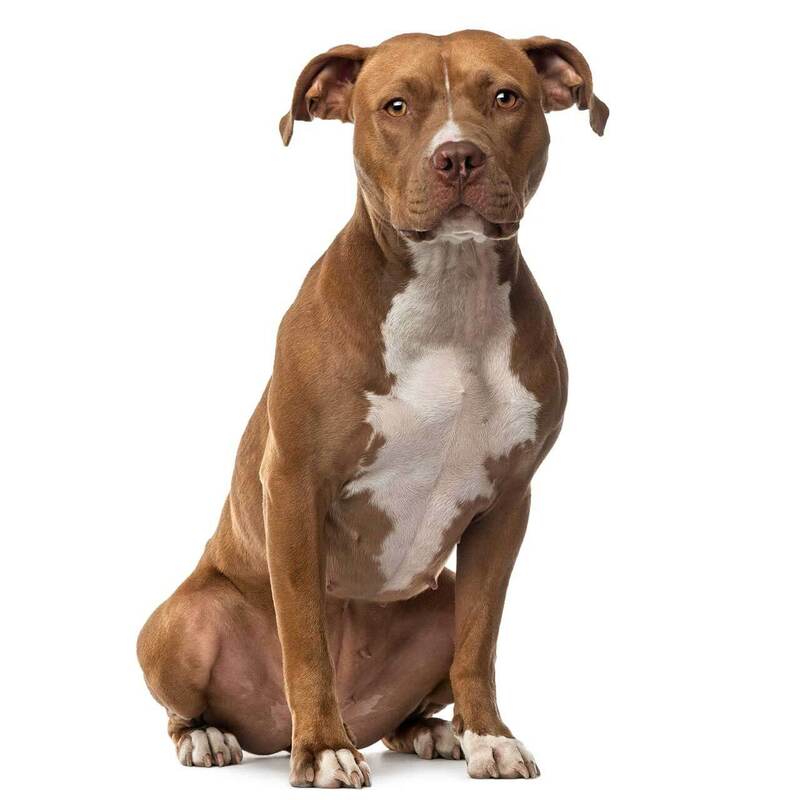 But be forewarned: if an unknown person makes sudden moves in the presence of the dog's family, or if an Am Staff perceives a stranger as potentially dangerous to family members, it won't think twice about attacking. 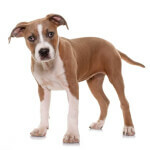 Below are images and pictures of the Amstaff dog breed. Am Staffs need a moderate amount of care – plenty in some areas, very little in others. First, a great deal of training (and supervision) will be necessary. This breed is known for its stubbornness and independence, so it will need a good bit of obedience and temperament training. But its short-haired coat is pretty low-maintenance, so not much grooming is needed. And Am Staffs are high-energy, playful dogs, so a lot of physical activity is necessary. Overall, this breed sheds minimally; the shedding can be a bit heavy twice a year, during the change of seasons. Brushing should be done about once per week to remove any dead hair, and to keep an Am Staff's coat shiny and healthy. And since this breed doesn't normally have much of a "doggy odor," baths are required only once every 3-4 months (or more, of course, if the dog has an affinity for mud). But Am Staffs, for some reason, are known for having bad breath, so many Am Staff owners brush their dog's teeth weekly to kill any harmful, odorous bacteria. With their bulging muscles and willful personalities, Am Staffs need plenty of daily stimulation – of both the physical and mental varieties. Outdoor play of any kind – catch, Frisbee, fetch, or chase – is great for these dogs. And with their playful natures, they won't hesitate to join in the fun. Am Staff puppies can be almost uncontrollably rambunctious, particularly when inside, so taking an Am Staff puppy (or a mature one, for that matter) on a long walk (always on a leash) will both rid the puppy of its excess energy and begin its education in proper discipline. After all, a tired Am Staff is a peaceful one. (A side note about young Am Staffs and indoor activity: as puppies, these dogs will invariably want to engage in horseplay anywhere, anytime. One such activity they seem to love is tug-of-war, in which they try to take items like clothes and toys from humans. Dog trainers suggest that Am Staff owners not engage in tug-of-war with these puppies; repeated tug-of-war "games," the trainers say, while seemingly harmless, teach the dogs to use their mouths to gain control of a situation – an unfortunate habit that could have disastrous consequences. Instead, the trainers suggest, try playing a gentle game of fetch with the item the puppy wants to have. 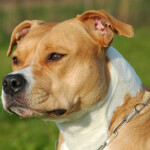 Am Staffs are best suited for homes with fenced yards. This breed will tolerate apartment living, but its active lifestyle will make apartment life practically unbearable. Due to an Am Staff's short coat, it is suggested that it not sleep outside; a typical Am Staff will prefer to be inside with its loved ones, anyway. In addition, tying or chaining up this breed – even in a fenced yard – is by all means not recommended, as this negative reinforcement will in turn instill negative behavior in the dog. This breed has a short-haired coat, and will thus be more comfortable in climates that are not exceptionally cold. An Am Staff's life expectancy is typically 12-14 years. 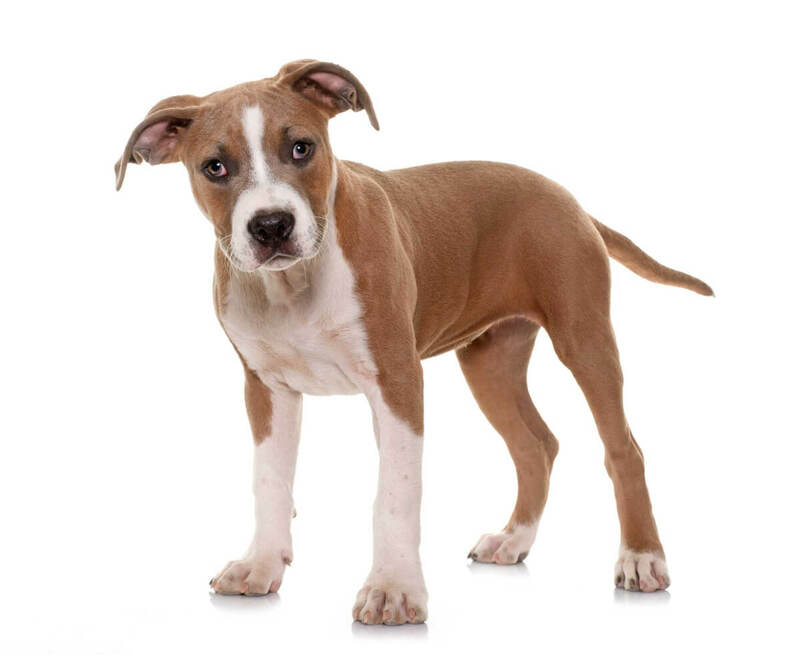 This breed is generally healthy overall, but may occasionally suffer from elbow or hip dysplasia, heart issues, mange, or hypothyroidism (a hormone imbalance that can be treated with medication). Experts suggest taking an Am Staff to a veterinarian for a thorough checkup upon first acquiring it, to diagnose any potential health issues. 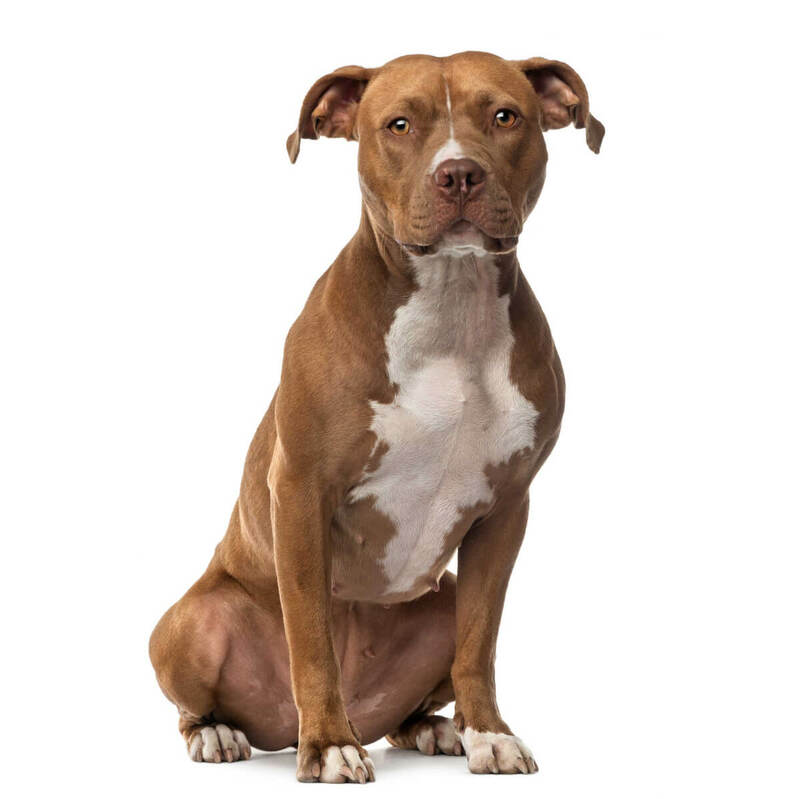 And because of its muscular structure, it is recommended that this breed be fed a high-quality dog food, one that is high in protein; feeding an Am Staff raw meat on occasion is a good idea as well.